The Human Torch is a fictional Character, a superhero that appears in comic books published by Marvel Comics. He is a founding member of the Fantastic Four. A similar, unrelated character of the same name and powers had been created in 1939 by writer-artist Carl Burgos for Marvel Comics' predecessor company, Timely Comics. Like the rest of the Fantastic Four, the Human Torch gained his powers on a spacecraft bombarded by cosmic rays. He can engulf his entire body in flames, is able to fly, can absorb fire harmlessly into his own body, and can control any nearby fire by sheer force of will. "Flame on! ", which the Torch customarily shouts when activating his full-body flame effect, has become his catchphrase. The youngest of the group, he is brash and impetuous in comparison to his reticient and compassionate sister, Susan Storm, his sensible brother-in-law, Reed Richards, and the grumbling Ben Grimm. In the early 1960s, he starred in a series of solo adventures, published in Strange Tales. He is also a friend and frequent ally of Spider-Man, who is approximately the same age as the Torch. More about Human Torch (Marvel Comics) Character Review - keep reading !! Chris Evans portrayed him in the 2005 film Fantastic Four, and its 2007 sequel Fantastic Four: Rise of the Silver Surfer. 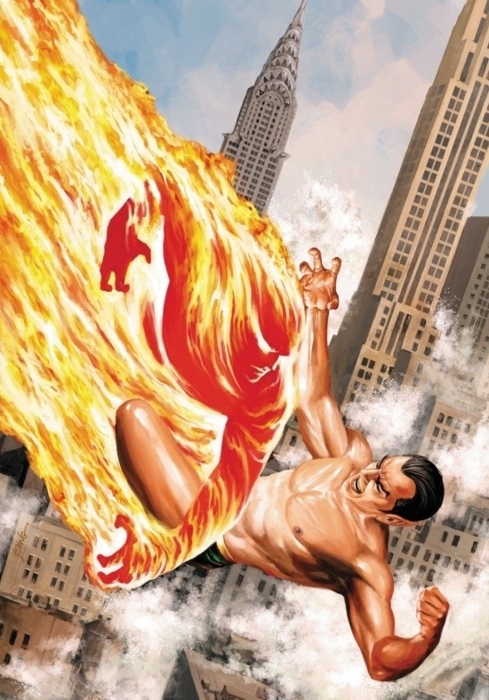 Johnny Storm gained a number of superhuman powers as a result of the mutagenic effects of the cosmic radiation he was exposed to, all of which are related to fire. His primary power is the ability to envelop his body in fiery plasma without harm to himself, in which form he is able to fly by providing thrust behind himself with his own flame, and to generate powerful streams and/or balls of fire. He can also manipulate his flame in such a way as to shape it into rings and other forms. Even when not engulfed in flame himself, Storm has the ability to control any fire within his immediate range of vision, causing it to increase or decrease in intensity or to move in a pattern directed by his thoughts. Additionally, he is able to absorb fire/plasma into his body with no detrimental effects. He has shown the ability to detect heat signatures (infra-red vision). The plasma field immediately surrounding his body is sufficiently hot enough to vaporize projectiles that approach him, including but not limited to bullets. He does not generally extend this flame-aura beyond a few inches from his skin, so as not to ignite nearby objects. Storm refers to his maximum flame output as his "nova flame," which he can release omnidirectionally. Flame of any temperature lower than this cannot burn or harm the Torch. This "nova" effect can occur spontaneously when he absorbs an excessive amount of heat, although he can momentarily suppress the release when necessary, with considerable effort. Storm can also direct momentary beams of "nova heat" as a weapon. Storm has demonstrated enough control that he can hold a person while in his flame form without his passenger feeling discomforting heat. His knowledge extends to general information about fire as well, supported by regular visits to fire safety lectures at various firehouses in New York. During a confrontation with Kraven the Hunter where he was poisoned, Johnny was able to cure himself by superheating his blood to burn the toxin out of his blood without Kraven realizing what he was up to. Storm's ability to ignite himself is limited by the quantity of oxygen in his environment, and his personal flame has been extinguished by sufficient quantities of water, flame retardant foam, and vacuum environments. He can reignite instantly once oxygen is returned, with no ill effects. 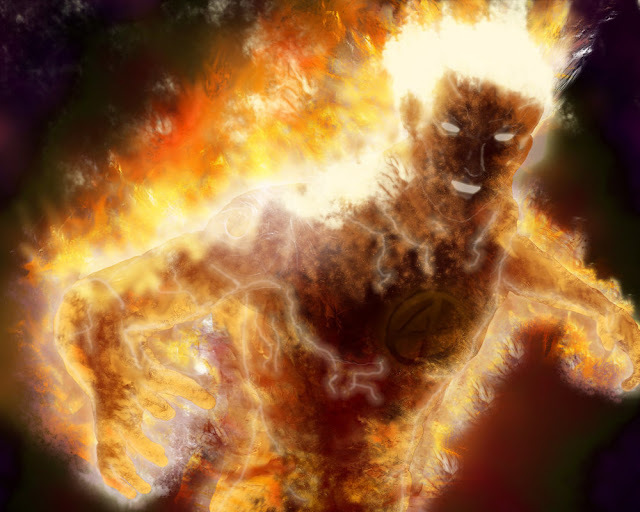 Very early in his career, Storm was depicted as transmuting his body itself into living flame; in all subsequent appearances his power consists in the generation of a flaming aura. Storm was trained in hand-to-hand combat by the Thing, and is highly skilled in the use of his superhuman powers in combat. He is also a skilled race-car driver, auto mechanic and designer. The Human Torch has been involved in several romantic relationships throughout the years, including, but not limited to, the Inhuman Crystal, member-in-training and future Galactus herald Frankie Raye, the Skrull agent Lyja disguised as Alicia Masters, and the Atlantean Namorita. Crystal dissolved her relationship with him due to the adverse effects of pollution within population centers of Homo sapiens. Frankie Raye ended her relationship with him when she accepted Galactus' offer to become his newest herald. Lyja, while in the disguise of the Thing's former girlfriend Alicia Masters, carried on a long-term relationship including marriage with the Torch, until it was revealed that her true nature was as a Skrull double agent. Although the two attempted reconciliation after it was learned that their "child" was actually an implanted weapon to be used against the Fantastic Four, they ultimately parted on less than favorable terms. Torch's brief relationship with Namorita lasted until he pursued a career in Hollywood. He has also had relationships with civilian women. Jay Underwood played Johnny Storm in the unreleased Fantastic Four film produced by Roger Corman. 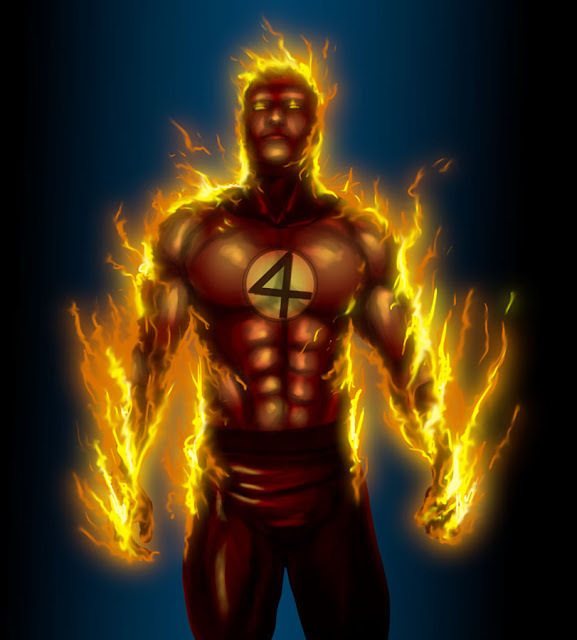 The Human Torch/Johnny Storm is played by Chris Evans in the big budget 2005 movie Fantastic Four. In the film, he is an intelligent, but arrogant, young man in his early twenties who loves extreme sports. He is the brother of Susan Storm, who works within Von Doom Industries as Victor von Doom's chief of the Science Department. Chris Evans reprises his role as Johnny Storm in Fantastic Four: Rise of the Silver Surfer. When his sister's wedding is interrupted by the Silver Surfer, Johnny pursues the Surfer and loses the subsequent confrontation. Due to his contact with the Surfer, Johnny is thereafter able to switch powers with any of his teammates through physical contact. This change thwarts their attempt to trap the Silver Surfer when he accidentally switches powers with Reed. However, when Doom steals the Surfer's board and powers, Johnny uses his change to absorb the powers of the entire team, using Sue's invisibility and his own flame powers to sneak up on Doom before overpowering him with the Thing's strength and Reed's elasticity. He loses the ability to switch powers when he makes contact with the Surfer for a second time.